Equipment: 4 by 4 board, 4 counters of one colour (4 dragons) and 12 of a second colour (12 swans). MOVES: All moves are horizontal or vertical, never diagonal. 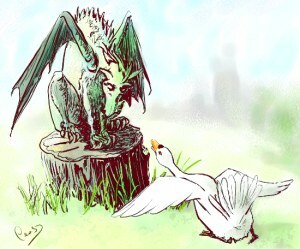 DRAGONS try to capture the swans. A dragon either moves one square to an adjacent square or captures a swan by jumping over it to an empty square the other side. SWANS try to surround the dragons so that the dragons are unable to move. Swans cannot jump or capture dragons. START: The game starts with the four dragons at the corners of the board and no swans on the board. PLAY: Swans start by placing one swan on a vacant square. Play alternates. A dragon must be moved when it is that player's turn. The swans are placed, one at each turn, in a vacant square and no swans can be moved until all the swans have been placed on the board. After that players take it in turns to move until either the dragon wins by capturing all the swans or the swans win by blocking in the dragons so they cannot move. PrimaryGames-Strategy. Addition & subtraction. Tangram. Compound transformations. Working systematically. Interactivities. Practical Activity. Visualising. Games. PrimaryGames-Number.